Hallo everyone! Such a late entry! But, it's gonna be a short one too, cause today is my birthday!! (less than an hour left here in Spain) And I just wanna share a few photos of some new food I've made today for my own (and friends & family) treat, and how I've celebrated my b-day! 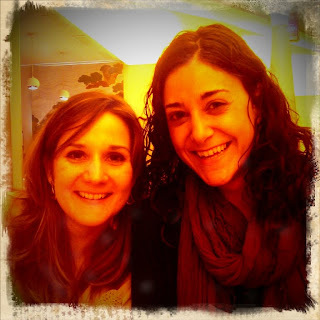 Yesterday I went with two of my besties to Madrid, to try cupcakes in a few bakeries that I discovered through Objetivo Cupcake, and to buy some baking goodies at some of the shops that I found out about in the same blog! Pilu, Sara & myself started the afternoon eating sushi for lunch, yum yum! 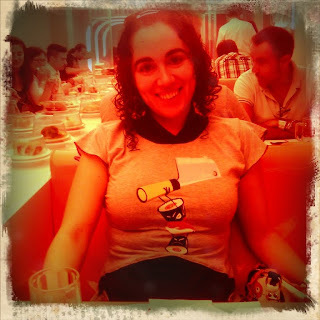 Sporting my Vivifromage Sushi top! Afterwards, we went on search for cupcakes! We started with Happy Day Bakery, a bakery with a lot of American style and very yummy cupcakes too! 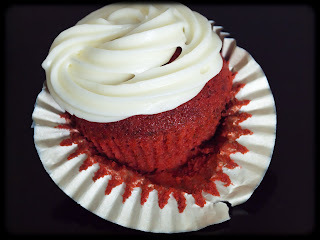 I tried a Red Velvet and it was really nice! We decided to drop by Comercial Minguez, a shop for everything baking related, and I was so overwhelmed that I only bought a pair of sprinkles and some super cute liners for Holidays time... and! I saw Alma, from Alma's Cupcakes, my future cupcake teacher! But since I wasn't sure it was her, I was a bit shy to go and ask her... silly me! Then we went to Cream Bakery, but it was closed cause they were prepping for Sugar'09, the baking national fair that is this week, and so were other shops that I had checked online, so we decided to go back home. We've agreed we need to plan another trip for more cupcakes! 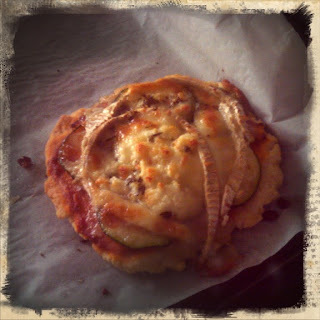 Today, for my birthday lunch, I decided I wanted to make home made mini pizzas, with goat's cheese and zucchini, and chicken brochettes! The mini pizzas recipe will be up on the blog soon, and the chicken brochettes recipe is HERE! And in the afternoon and evening I had some friends come over, to spend some time catching up, so I baked some Chai Latte cupcakes, with a recipe from "Vegan Cupcakes Take Over The World" and instead of the suggested icing, I used a honey buttercream from a new blog I've discovered, Carrot Cake! Very yummy!! I got some nice pressies, some of them handmade! and also spent some awesome time with friends and family, so it was a very nice birthday! Tomorrow will go back to work, with the leftover cupcakes, to share with my co-workers! 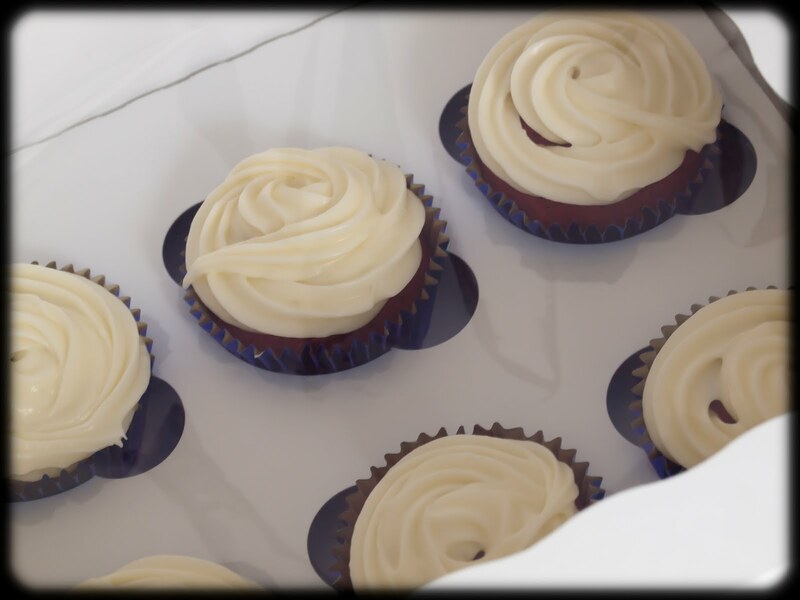 Monday Munchies: Chocolate cashew cupcakes with cream cheese and orange marmalade icing by Alma's Cupcakes! Hello everyone! How's the week starting? I hope that at the worst, as good as mine is! This week is my b-day week, so I've decided to pamper myself as much as possible! And to start the week right, I've been to the Spa this morning where I got a Japanese treatment and a full body massage... bliss! 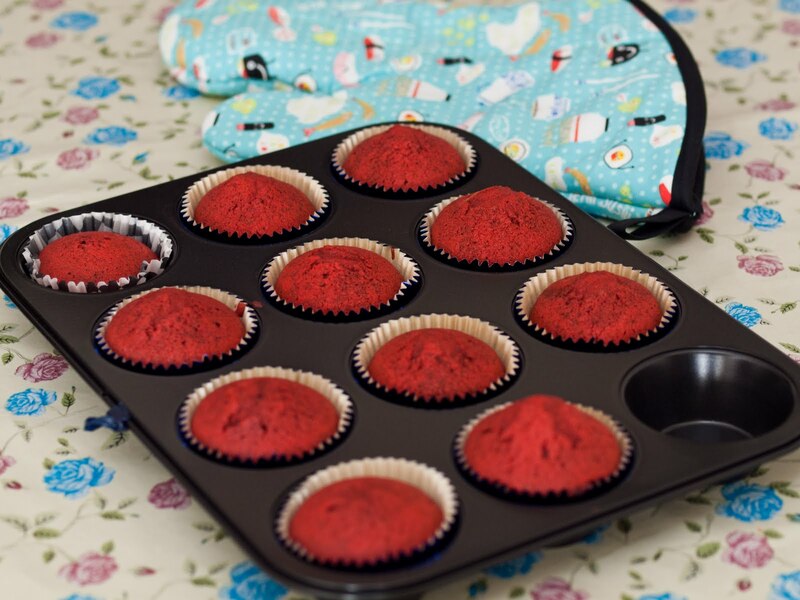 And to share a little bit of goodness with you all, I'm sharing a super yummy cupcake recipe as my Monday Munchies entry of this week! 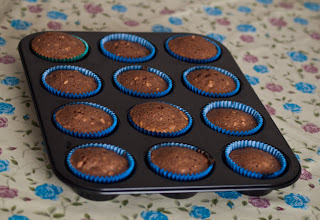 As usual as of late, this recipe is taken from Alma's Cupcakes blog: Objetivo: Cupcake Perfecto, but it's a bit of a mix of two of her recipes. Chocolate & cashews cupcakes with cream cheese & orange marmalade icing! 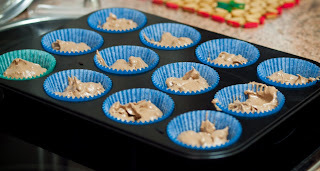 - Preheat the oven at 180ºC (350ºF) and put the cupcake liners in the mold. Cream sugar and butter until white and fluffy. Shift the cocoa, flour and baking podwer all together and add to the butter and sugar mix, folding carefully, add the milk and mix till well combined. - Once well mixed, add the crushed cashews and fold in. Fill the liners up to 2/3 only and bake for about 20 minutes, or until an inserted toothpick comes out clean. - 60 gr unsalted butter (room temperature). - Mix the icing sugar with the butter (be careful, if doing it by KitchenAid or similar, cover it first). 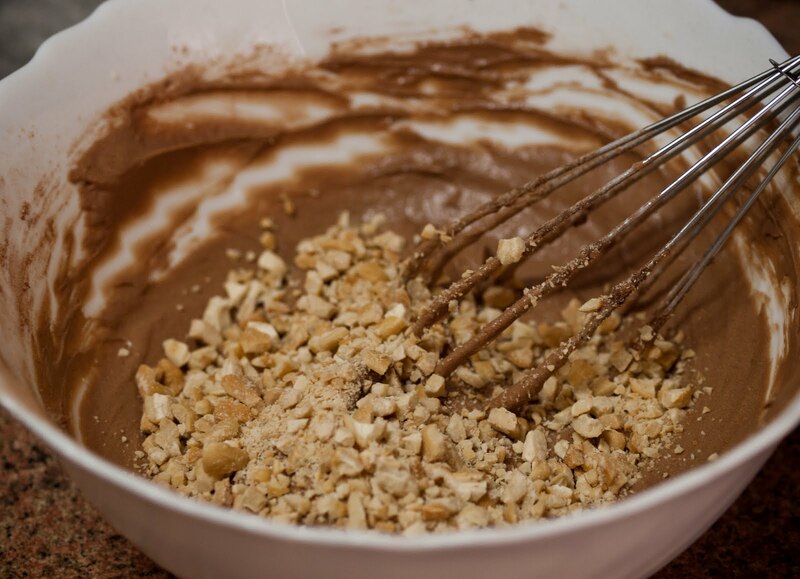 Once it's well mixed, add the cream cheese and mix till white & creamy, don't overmix it or it will get melty. Then mix the orange marmalade and fold it in. 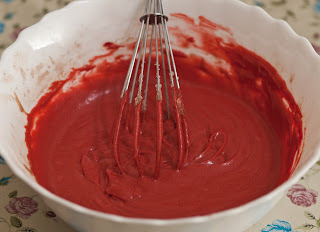 I'd recommend mixing only one tablespoon in two times, so it won't change the consistency of the icing too much. You can pipe the icing with a pastry bag or with a spoon for a more rustic look. 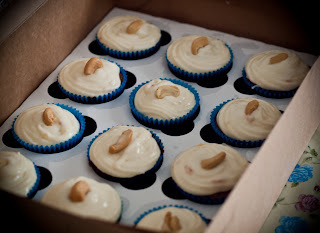 - You can decorate with some cute sprinkles, or if you don't have any, add a cashew on top of each cupcake as I did! Saturday Song: Hijo de la Luna - Mecano!! 300 entries already!! Goodness, am I verbose or what?!? Yes my dears, today with this entry I've reached my 300th entry on this humble little blog of mine! I don't have anything big planned, because I kinda just noticed when I cliked on new entry and saw the counter was 299... but I thought that I'd share one of my fave songs from all time with all of you for this Saturday Song, and since it's a song in Spanish from a Spanish group, I'm sure most of you haven't heard it before! Mecano had to be the biggest Spanish group in the 80's & early 90's, they were a trio, Ana Torroja, singer and the Cano brothers, Nacho & Jose musicians and composers. Every kid in Spain born in either 80's & early 90's know of them, and their songs very well known all over Spain and Spanish speaking countries. Recently there was even a musical made with some of their most popular songs called "Hoy No Me Puedo Levantar" that was a massive success all over Spain (and I went to see twice) and was also very successful in their Mexican encarnation. This song is called "Hijo de la Luna" (Moon's Son or Son of the Moon) and it's based on a gypsy legend, where one gypsy woman wanted to find a partner so she used one spell on the moon, so the moon will get her a lover, and in exchange the woman would give the moon her firstborn. It's a legend about love, despair, jealousy and treason. It's Friday now! And even though I work today and tomorrow, after that I'm gonna be enjoying a few good days off to celebrate my b-day (that'll be next Wednesday!). 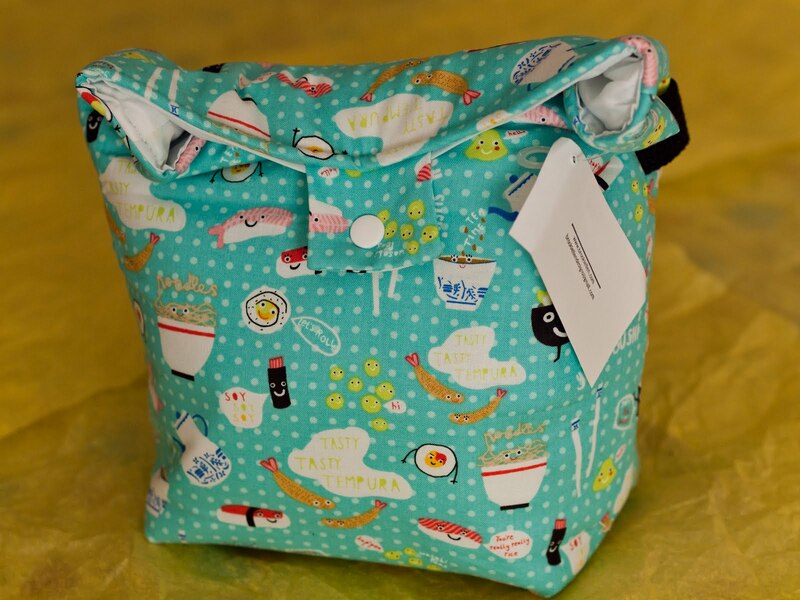 For today's Friday Feature I wanna introduce you to BrookiEllen, a very very talented lady, that doesn't limit herself, since she has diaper covers for babies, sandwich and snack baggies and lunch totes in her Etsy shop, and all in the cutest and coolest fabrics ever! 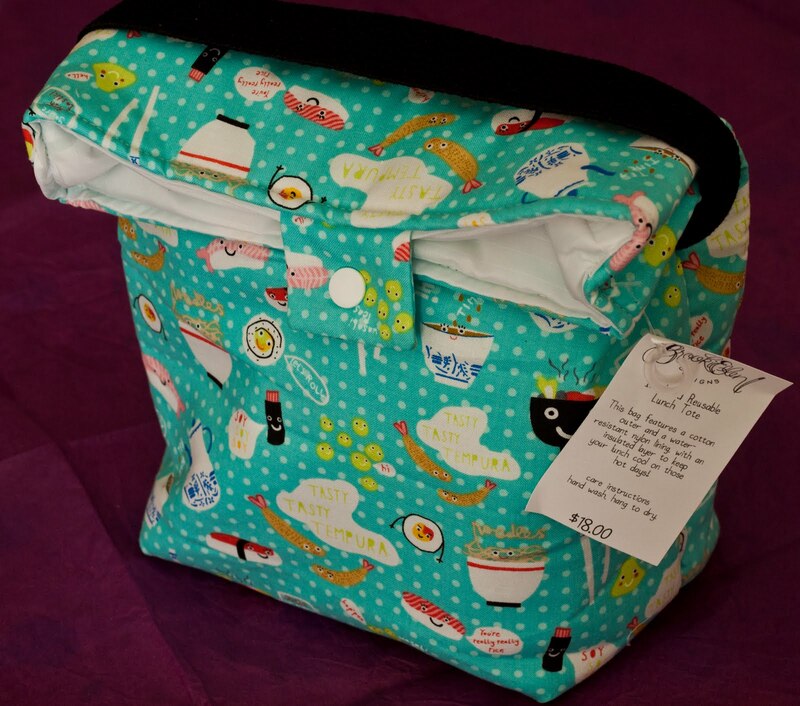 I got myself a super cute lunch tote from her shop, but I have to confess it was mostly cause of the fabric it was made of! And maybe you have guessed what fabric it was? 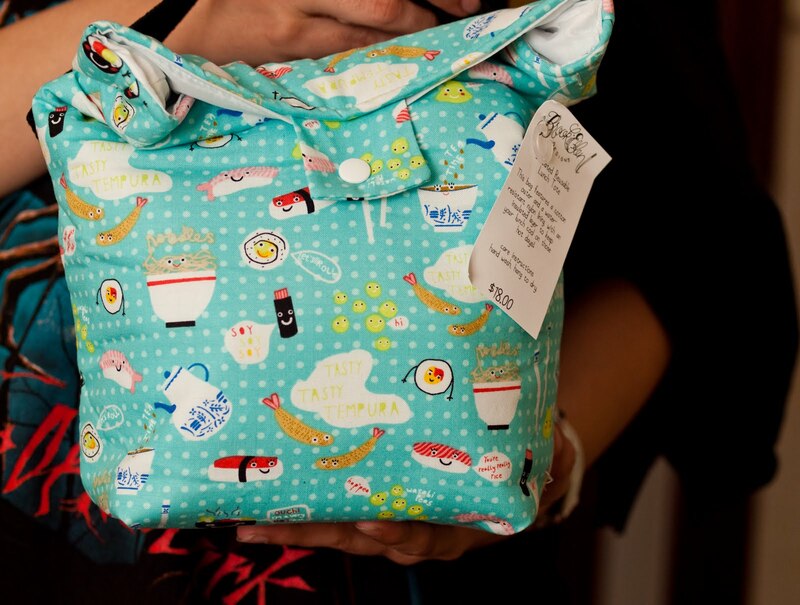 Yep, sushi fabric! 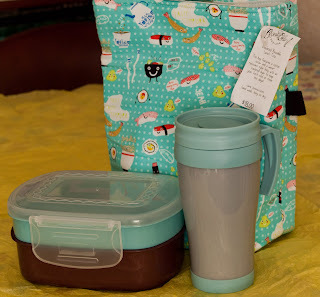 It isn't too big or bulky, which is good, I don't want it to take too much space, and since it has a handle it can be toted around on its own, or be packed inside a bigger bag. 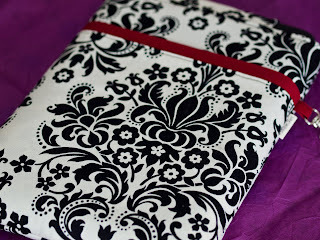 And did I mention I love the fabric? I don't take lunch or breakfast with me to work, cause most days I barely have time to have my coffee while getting filled up on my patients during shift change, to even have time for a snack (that's where my Tokyotombola fruit cozies come in). But for night shift, it's 10 hours, so even if it's at 3 am, I do have time (and need) for some form of a meal (late second dinner? early heavy breakfast? ), so this lunch bag will keep my food safe and cozy! 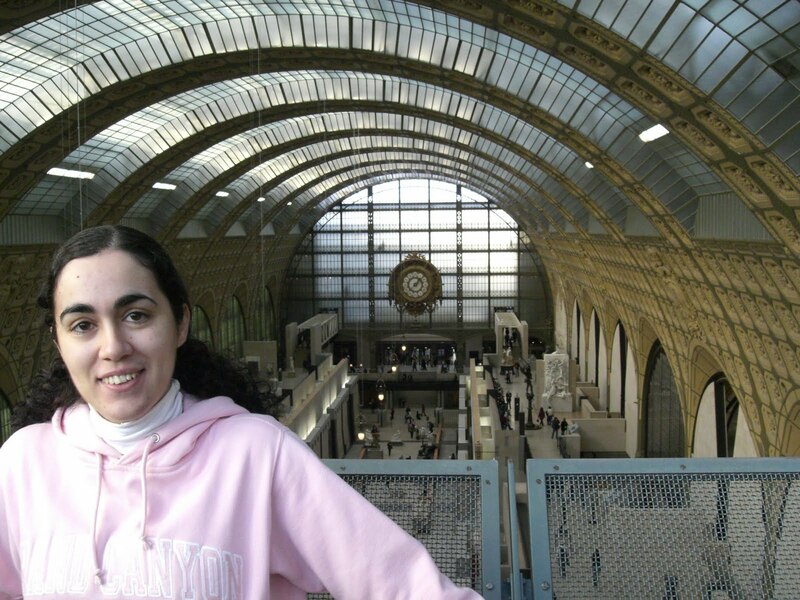 Traveling Thursday: Paris Part 2!! Hello everyone! I'm back a bit later than usual this week, but my Google Chrome was having issues with blogger, I had to delete a blog I was following that had some "suspicious activity" to be able to use blogger again normally. So, today I'm back with a new edition of Traveling Thursday, with a second edition of photos from Paris! 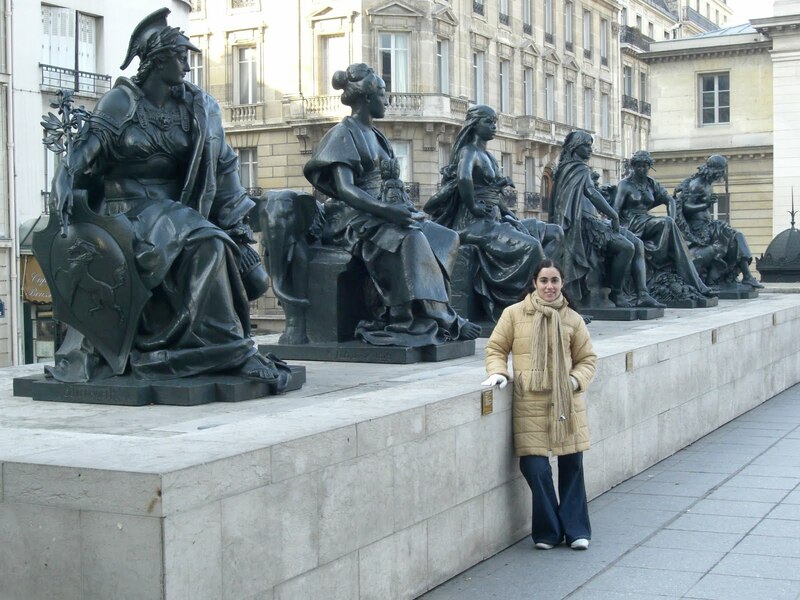 This time from my second trip to Paris in Jan '06. 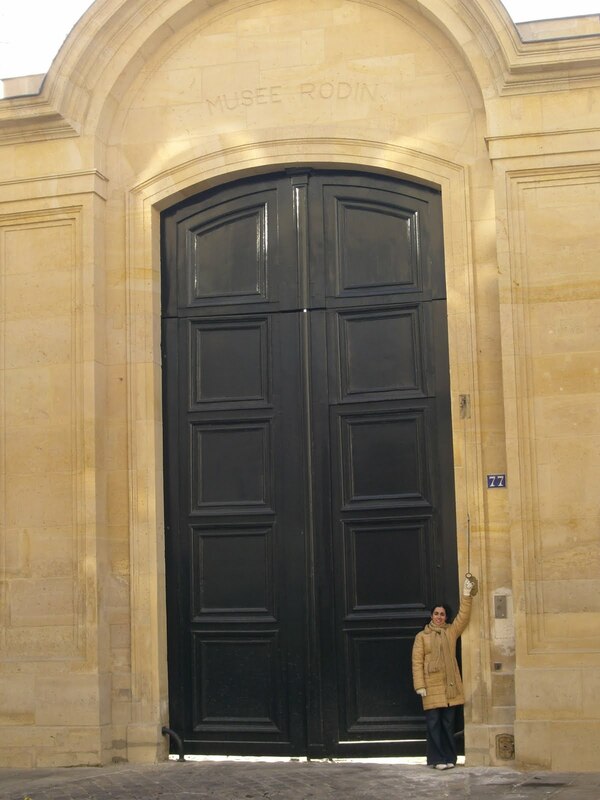 The door for Rodin's museum was quite something! View from the second floor, the museum used to be a train station! My beloved Notre Dame de Paris, back view and freezing, damn it was cold! 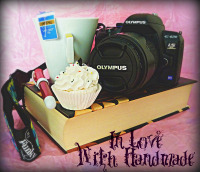 A special about why to buy handmade & local. Today is gonna be a sweet & short post, cause I wanna share with you a link to another blog post from an awesome blog called Modern Rosies, a blog you all ladies with business or that love handmade NEED to follow, a blog post with an amazing video made by the awesome Sheika Lugtu aka Sheikasaurus Rex! If you already shop handmade & local you'll feel extremely justified & happy to do so, if you don't you might just give another look at things, and give handmade a try! Wearing my Collisionware sushi apron to bake Red Velvet cupcakes! 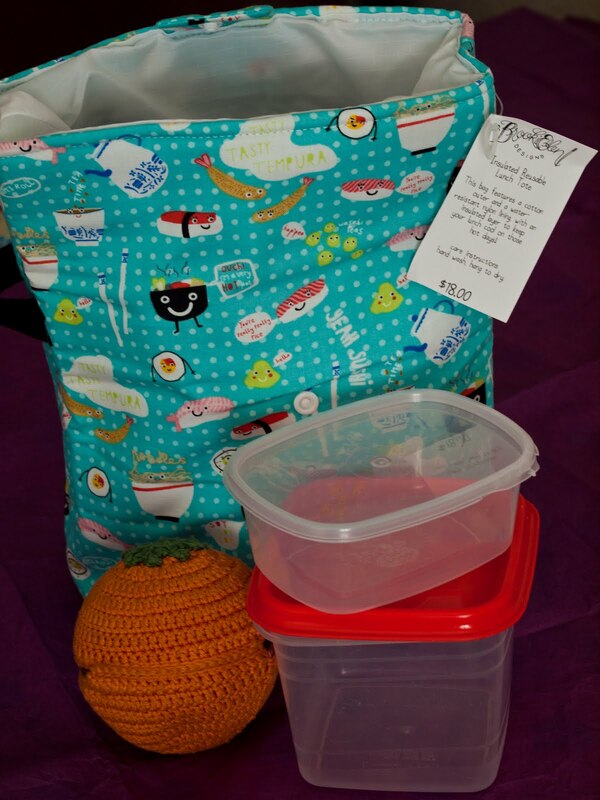 This is not the first time I've featured Collisionware in the blog, cause I've got me a pair of her pot holders & oven mitts sets for myself (actually, 3 sets) and I've also got a pair of sets as gifts for friends. 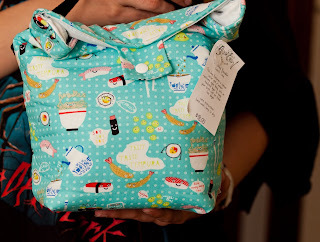 After getting my latest set, made of the sushi fabric I'm so totally obsessed with as of late, I thought I had plenty of wares for the kitchen, but when I saw an apron made with said sushi fabric... I just new I needed it! And so did Angie, the lady behind Collisionware, cause she wasn't the least surprised when it was me who bought the sushi apron! Angie has many other oven mitts and pot holders, some character oven mitts and plenty of cute aprons (along with her wallets), and she's also offering skillet mitts, and the sushi one of those will be my next purchase from her shop for sure! Still undecided if I'll go to her Etsy shop or to her shiny new website! 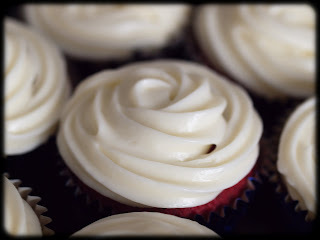 Monday Munchies: Alma's Red Velvet Cupcakes!! 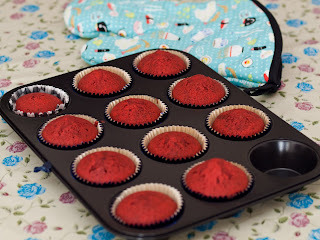 For Monday Munchies this week I'm sharing a recipe from Objetivo: Cupcake Perfecto, the blog of my cupcake inspiration and future teacher in a workshop, Alma from Alma's Cupcakes! Here's her recipe: Red Velvet Cupcakes, and for those who can't figure out the Spanish via Google translate, here's the one you can find in Joy Of Baking, that is essentially the same. For me it's just that Alma gives you some tricks to adapt things to the Spanish way (how to sub for the buttermilk) and she makes it sound simple (and delicious) enough to make you want to try it! Alma's recipe was for 8 big cupcakes, but I got 11 regular sized ones! 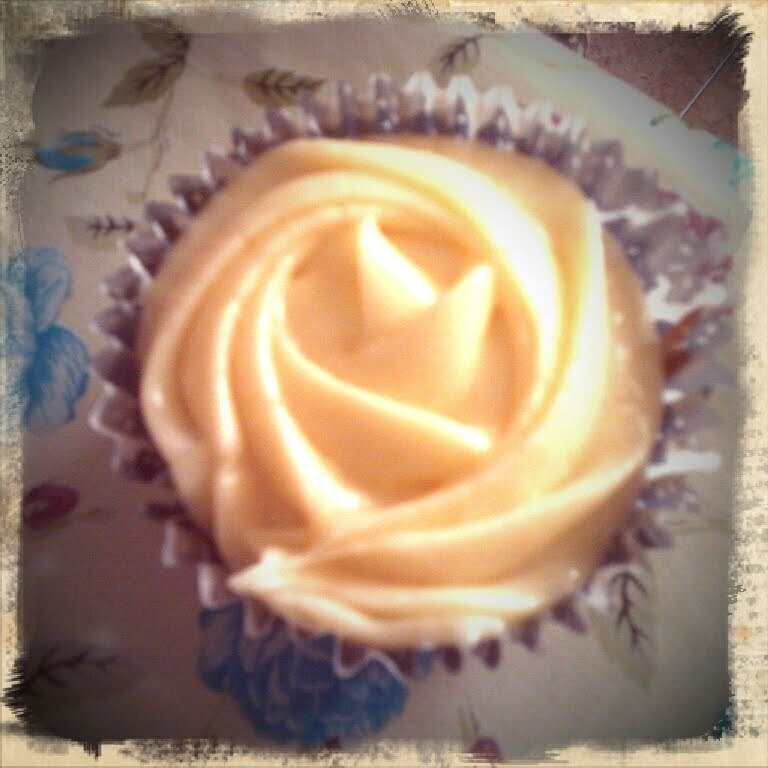 Cream cheese icing: sinfully delicious!! Once they were done I ate two cupcakes on a row... and that's a first! Six of them all ready to be taken to work tomorrow! My icing abilities still need a lot of work, but with the Wilton 1M tip from Alma's kit from For The Cakes and Alma's tutorials, I'm getting better! I do need that November workshop, but I won't be such a lost case for Alma then! These have become my favourite cupcakes, no contest! The icing is delicious (after eating what was left in the pastry bag, I decided I needed to wash the bowl before I ended up licking it clean!) and the cupcakes themselves are really fluffy and just plain yum! For today's Saturday Song I want to share with you a heavy metal version with cellos of a classic music well know tune. 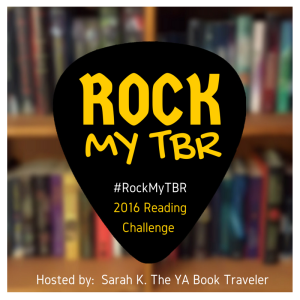 It's "The Hall of the Mountain King" by Apocalyptica! G & me saw this guys at the Sonisphere festival in July, and they are absolutely amazing! The can play anything on their cellos, from classical music to Metallica, to their own songs, and they absolutely rock!! And they can also headbang like nobody's business while playing their cellos!! Friday is here, and it brings a weekend at work for me, but it's also time to show off and share one of my latest loves from a shop that I adore and will continue to feature often here: StellarCheri!! If you think the name is familiar, you are right, I've featured StellarCheri items in previous blog entries (here and here), and I have yet another two more in the planning! Cheri, the super talented lady behind this shop, is amazing, and a total joy to work with on custom orders! 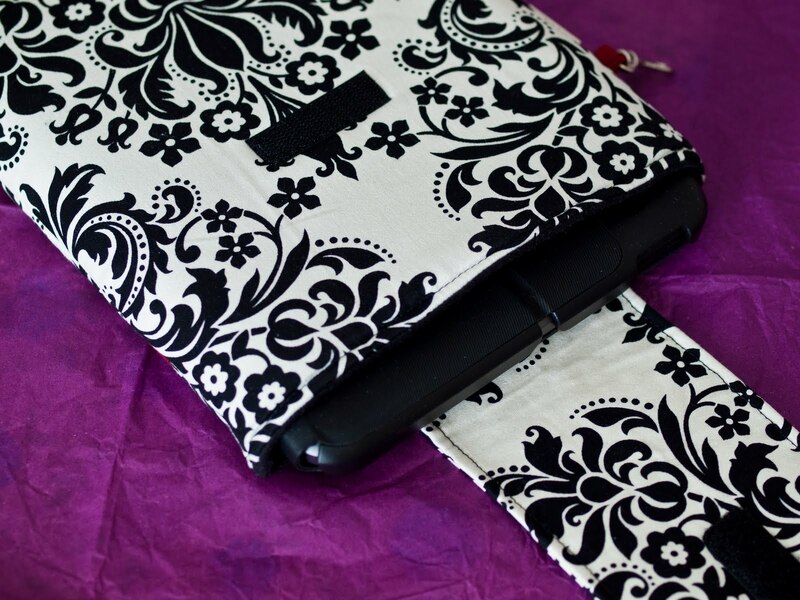 A while back, and I mean quite a while back, Cheri started working on iPad sleeves, and she made three that were a wee bit tiny for the iPad, so she was offering them with a very nice discount. 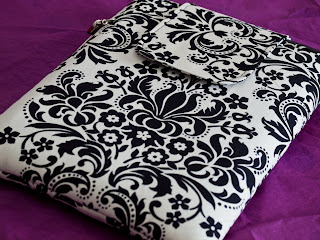 I was already thinking of getting myself an e-read (Kindle, Nook... the works) at some point, and fell in love with the damask sleeve, so I thought, why not? and got it. So, there I was, with an awesome sleeve for an e-reader or tablet slightly smaller than an iPad, and nothing to fill it with! Fast forward to earlier this year... I started telling G that I wanted an e-reader and couldn't decide between a Kindle or a Nook, and he told me to first see if I could manage the whole reading-something-other-that-is-not-a-proper-book, and suggested I started using this app in my phone called Aldiko. Fastforward through the last Sookie book and many Discworld ones, and I was more than ready to upgrade to a big screen! 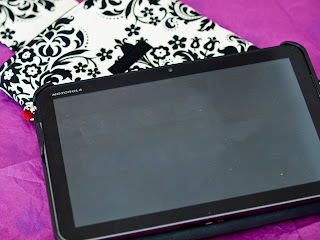 I told G I really wanted an e-reader for my b-day, and during my trip to Zurich with his sisters, his sis from the US brought me his present, a very shiny & cool new tablet, the Motorola Xoom! Where I can use Aldiko to read as many books as I want, and do many many more things! 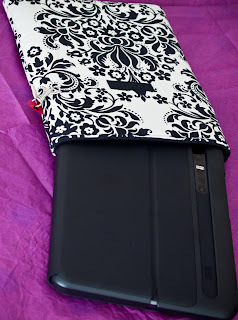 Upon returning from my trip to Zurich, Xoom in hand, I went straight to look for my tablet sleeve, and oh joy! 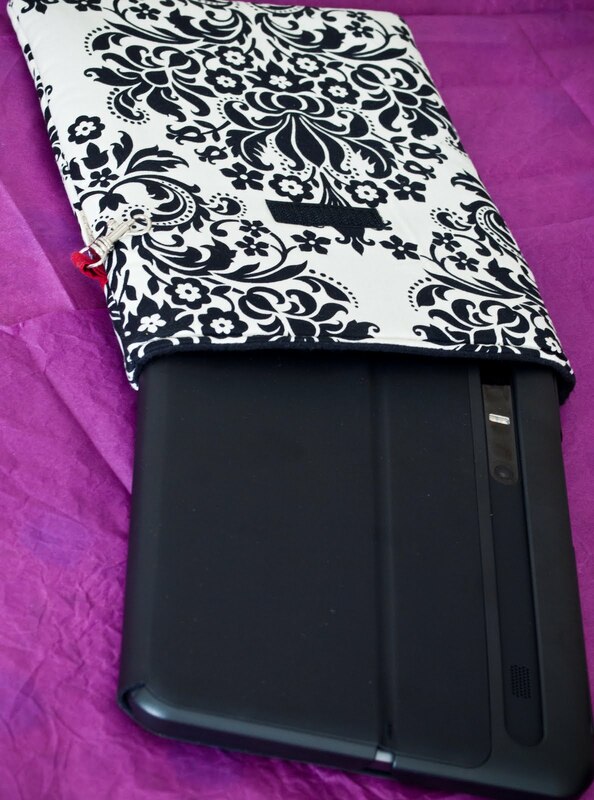 it fits my Xoom perfectly!! So now, I'm such a happy camper! 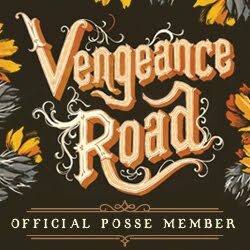 I have an early b-day gift (and what a gift it is!!) 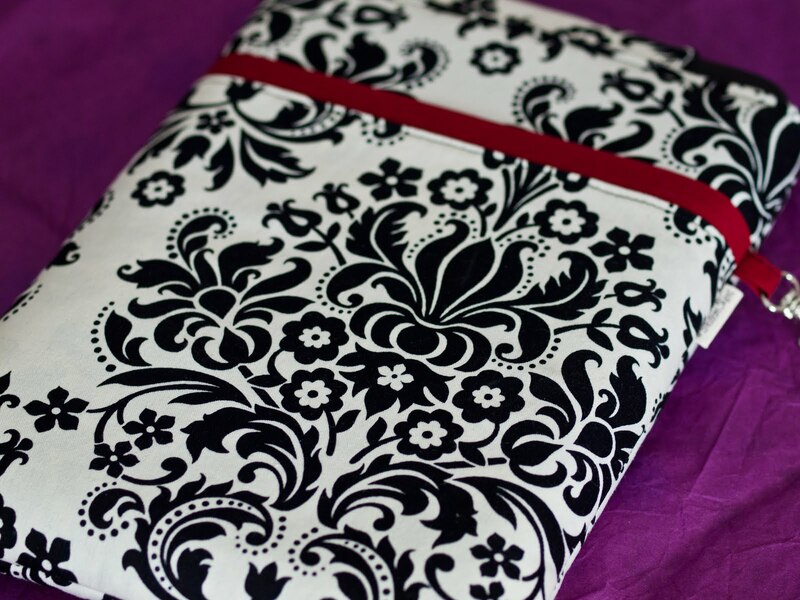 and I have a fantastic handmade sleeve, in a fabric I adore, with plenty of padding to protect my little Xoom of harm! 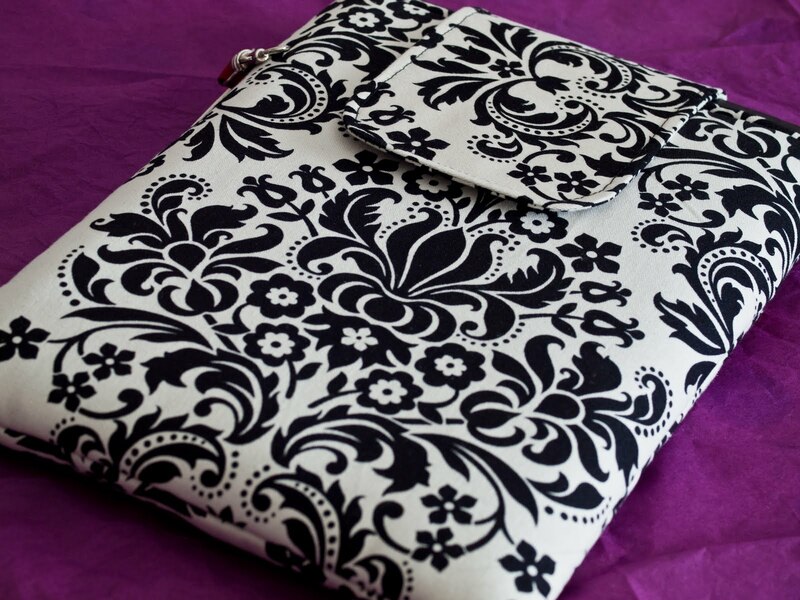 Closes with a flap and velcro, so it's easy to open and close, and not metal to damage the tablet. With a pocket in the back (love the contrasting red!) where I keep the connecting cable to hook it to my lappy to transfer books, movies or photos! Opens at the top, and the velcro seems a better option than zippers or anorak closings to avoid any kinda scratches to the case. 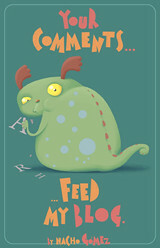 My Xoom! With its two cameras, and its hard case cover to protect the screen (and also to make it more like a book when reading!). A match made in heaven indeed! 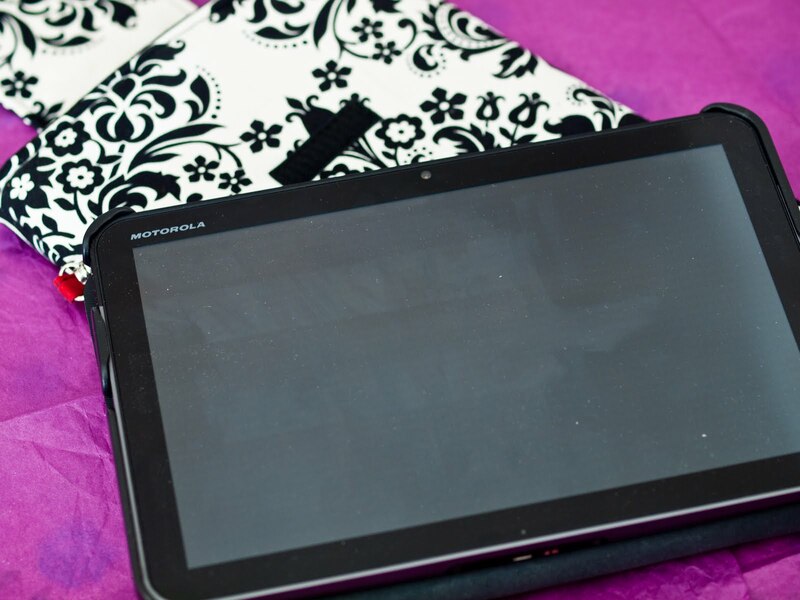 An awesome tablet with an amazing cover! Sometimes things work out really well, and this was indeed one of those! Thank you baby for this very awesome gift, and thank you Cheri for the perfect sleeve for it! Hello everyone! I've been a bit lacking on the blogging department this week so far, cause I've been lacking on motivation... work has been a bit more taxing than usual for me, and I haven't been feeling like doing much. 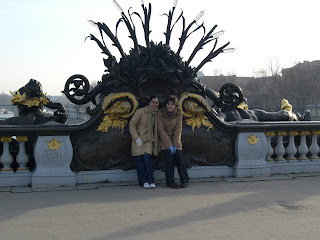 But today, after some odd short naps after night shift, I decided that a good way to get off my slump was sharing some photos from my first trip to Paris! 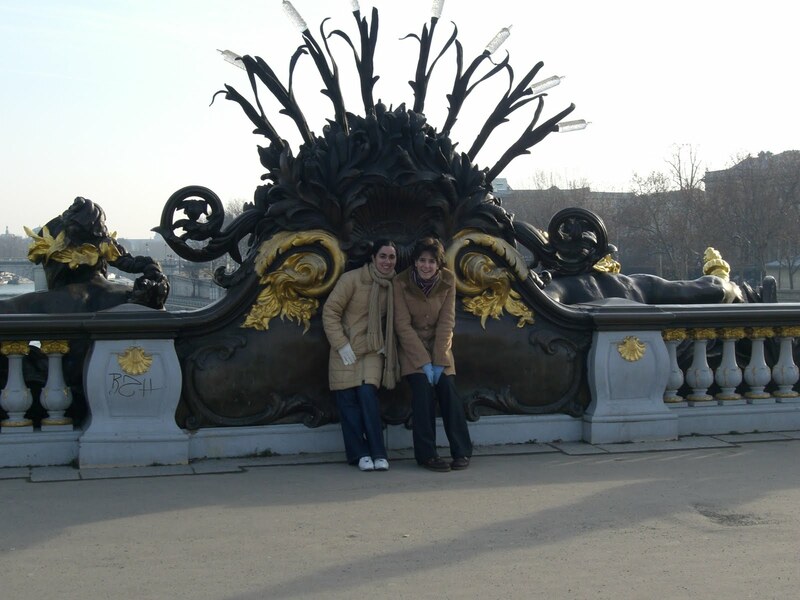 My friend Esther (and fellow nurse) decided to try her luck and work for a while in Paris, so me & Pilu decided it was the perfect excuse to visit her and the city... and Disneyland Paris!! On arrival, we rushed to see the Louvre! Gotta love the Cheshire cat! An X-Wing! We had a blast at Disneyland! 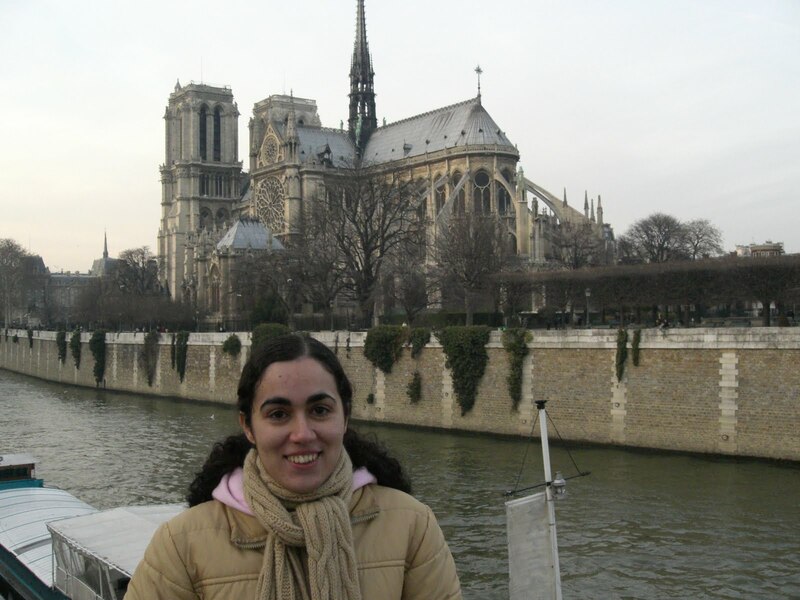 And my fave place in Paris... Notre Dame de Paris! I'm really hoping I can go back to Paris (and visit more of France) at some point with Gaurav, and I can't wait to go and take gazillions of photos of Notre Dame with my beloved Olympus!! Friday is here! And I'm pretty excited cause I have half the weekend off, and tomorrow I have a meet up with all my friends from uni, which is quite an unique event that only happens like once a year or so! 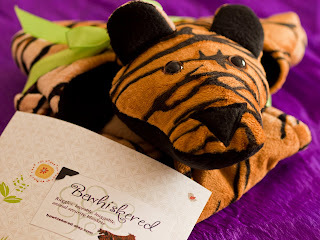 And to celebrate Friday with a new Friday Feature I wanna share a shop that you'll love if you have any kids in the family: Bewhiskered! I met Kenzie, the amazing lady behind Bewhiskered's Ruggles through the AOTC forums (the place to meet amazing crafters & designers) and that's how I discovered her shop and all her amazing animal blankies for the kiddos, that she calls Ruggles. You can find all sorts of animals, made out of all sorts of fabrics (and not real fur), from dragons to froggies with anything you can imagine from the animal kingdom! She also makes customs, so if you want a bumblebee ruggle instead of any of the ruggles she has in her shop, you'll be sure to get yourself one. 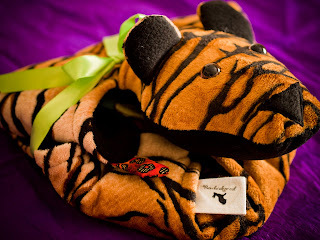 I knew I needed to get one for G's nephew, RD, and since he loves Jungle Book and tigers and wild animals, I knew the Tiger Ruggle would be ideal for him! She even embroidered his name in the tummy of the tiger, making it even more personalized! 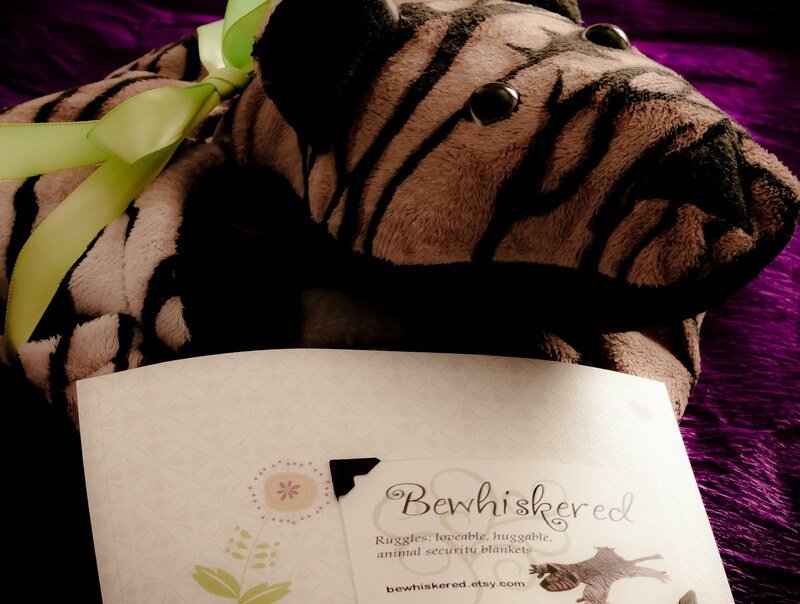 When I got the tiger ruggle I fell in love with the packaging! It even came with a birth certificate of authenticity! It's not likely the kid will notice or care much about either, but the parents will surely comment on it, my SIL did! All RD cared about was the tiger he now had in his hands, he started saying "Shere Khan, Shere Khan!" and roaring around! RD sure liked his lil tiger ruggle, and I'm sure any kiddo that you'd have in the family would too! Even as a grown up, I wouldn't be adverse to one, and I keep on eying the giant Ruggle listing she has in her shop for the day when I have my own place!